Chett is out riding with his obnoxious friends when he stops to take a leak. They leave him behind and he’s pissed about walking home. He runs into a stray dog, who won’t stop following him. At first, he tries to shoo the dog away, but it won’t leave. Chett likes the dog’s persistence and brings him home, naming him Buddy. 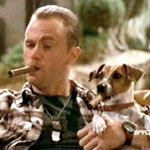 He’s very sweet and cuddly with the dog, in addition to sharing a cigar with his new best friend. Lisa loves how affectionate Chett is with the dog. Chett remarks about how his human friends are jerks and how he wishes his friends could be more like the loyal dog. Sooo... Lisa turns Buddy into a human. The actor who portrays the dog/man is brilliant! The human version of Buddy still acts very dog-like. He wants to be petted and follows Chett everywhere. When Chett takes his new pal out, the girls pay a lot of attention to Buddy because he’s so cute. Chett is amazed and likes the attention he gets being Buddy’s friend. Then Chett gets a date and Buddy wants to go along. But Chett tells Buddy to stay and leaves without him. Buddy panics and tears the house apart. Chett’s date, Amanda, admits she wanted to go out with him because her friend liked Buddy. Her real boyfriend shows up and gets rough with Chett, who handles him just fine. Buddy shows up and Amanda is all excited to see him and admits she actually likes Buddy. Chett is jealous. He goes home to the mess and is angry with Buddy. Chett drives Buddy out to the country where he originally found him and leaves him there. When he gets home, Chett misses Buddy and has flashes of memories. He feels guilty and goes to look for him. During his search, he falls into an old well and Buddy finds him. He tells Buddy to go for help. Buddy leads Lisa and the boys to Chett. Buddy turns back into a dog. Later, at the coffee shop, Chett sees a man putting up posters, looking for his lost dog -- it's Buddy. Chett doesn’t want to give Buddy up, but he knows he has to. After they say their good-byes, Chett is sad and starts getting attention from the ladies. He winks at Buddy across the room.